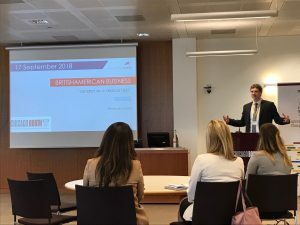 Today, BAB London Executive Director Emanuel Adam delivered a presentation to students and colleagues at The University of Chicago Booth School of Business on the city in which the school is located, London, UK. The presentation looked at London’s status as a ‘Global Hub’, and the historic and contemporary factors that have allowed London to build, maintain and grow its position on the world stage. Using members of BAB’s London staff as case studies, Emanuel went on to show the ‘human’ side of what makes London such an attractive place to visit, work and live. Whether it be the language, its importance both in world politics and business, its culture, or the fact that is is simply a great city, each of our staff has a different reason for making London home. If you would like to read Emanuel’s presentation, please click here.